Happy Kitchen Sink Monday! Today I'm sharing a card based on this version I posted last week. 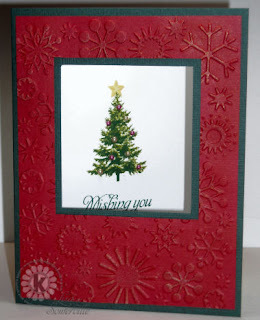 For this card I used the Square Window Overlay Kit from The Paper Cut. These precut kits are a time saver when creating cards. As on the previous card, I embossed the Red layer with the CuttleBug Snowflakes Folder, I added some highlights to the embossing using Brillance Gold Ink (it's best to heat set before finishing your card). The white panel is adhered to the base card, you'll do your stamping of the Multi Step Pine Trees right though the opening for proper placement. Add your star from the Multi Step Ornaments & Star, then finish with your sentiment from the Multi Step Hanukkah Set. The ornaments are stick on Pearls from Kaiser. Don't forget you have until November 27th, to enter this months Kitchen Sink Stamps Challenge, click here for more details. Thanks for stopping by, for more Kitchen Sink Stamps inspiration, check out the other DT members blogs: Angela, Connie, Julie, Lynn , Makiko, Maria (KSS Owner). I can't wait to get my Pine Trees!! I love all the beautiful cards you are creating with it!! Love the pearl ornaments on this one!! What an exquisite Christmas card!! Just beautiful, looks so real! This is absolutely gorgeous! I just bought the pine trees last night! I love how you used pearls for the ornaments! Brilliant idea!!!! This is just so pretty, Lisa!! 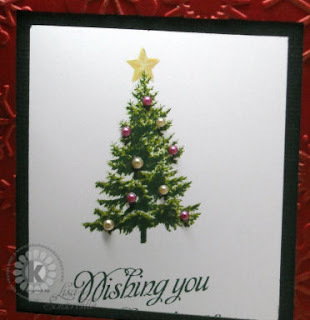 Love the pearls on the tree, wonderful dry embossing too!! So beautiful! I love the window, and thanks for the tip on precutting them, makes perfect sense. I'm definitely going to have to find some of those pearl embellishments. Very pretty! Love the pearls for the ornaments! This is gorgeous, Lisa!! The pearls are so wonderful to decorate the tree, too. Fabulous job as always!